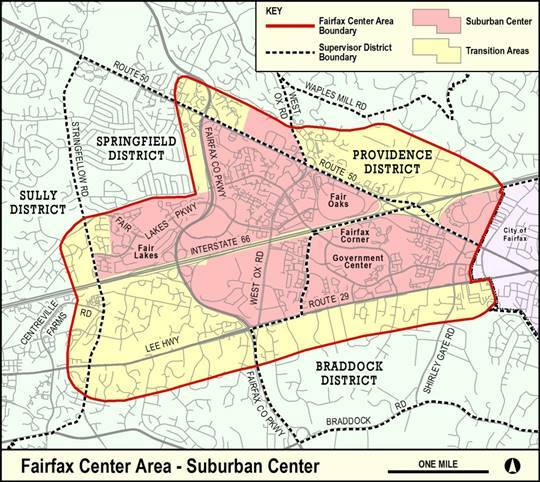 Fairfax County is updating the Comprehensive Plan for the Fairfax Center area. One of the issues to be address is the need for safer and more convenient biking and walking access. If you want to learn more about the process, a working group planning meeting is on Tuesday, March 8 at the Fairfax Co Government Center. 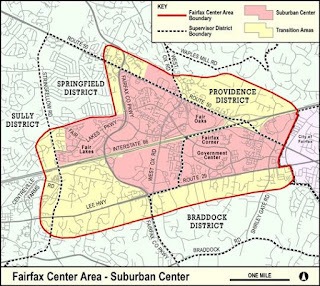 Phase II of the Fairfax Center Area Study is now underway. This phase focuses on Comprehensive Plan recommendations within the Fairfax Center Area. An areawide Working Group has been formed to review submissions for proposed Comprehensive Plan changes and provide guidance during this phase of the study. At the next meeting, the Working Group will hear presentations on areawide submissions for the study area, including topics such as heritage resources, parks and recreation, transportation, land use, and the environment. There will also be an introduction to the implementation tools for the Fairfax Center Area. The Working Group will provide feedback to staff on these topics for consideration as the Areawide Recommendations for the Fairfax Center Area are reviewed and updated. The agenda will be posted on the study website in advance of the meeting. In a recent survey conducted by AAA Foundation for Traffic Safety motorists were asked their views on traffic safety and motorist behavior. Not surprisingly, many motorists admitted to acting in a dangerous manner while at the same time castigating others for similar behavior. Almost everyone thinks drinking and driving don’t mix, but 1 out of 8 drivers admitted that they have been close to or above the legal limit in the past year. Almost 90 percent of people think texting or emailing while driving is dangerous, but 42 percent said they had read a text or email while driving in the past month. Most people said that distracted driving has become a bigger problem in the past three years, but 70 percent said they had talked on the phone while driving in the past month. Although speeding is a factor in about 10,000 deaths per year, close to half of those surveyed said they were guilty of it on freeways and residential streets. Intersection collisions cause nearly 700 deaths and 125,000 injuries, and drivers deplore people who run red lights, but 39 percent of those surveyed said that in the past month they had run a light that had just turned red, even though they could have stopped safely. Virtually everyone sees drowsy driving as a serious threat to their safety, but more than 30 percent said they have had trouble keeping their eyes open while driving in the past 30 days. In the past few weeks I've been driving more than usual. Other driver's behavior seems to be getting worse. I drive the speed limit and I would guess that over 80% of other drivers are exceeding the speed limit. Many will tailgate and pass dangerously. Even when conditions are bad with water and snow and ice on roads motorists were driving faster than was safe. Almost no one stops at red lights when turning right or at STOP signs. Maybe police have given up. I think our political leaders need to use the bully pulpit and ask motorists to begin to obey the law and drive more safely. It's better for them and safer for bicyclists and pedestrians. 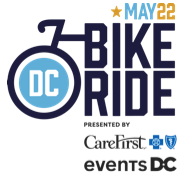 DC Bike Ride, a scenic urban bicycle ride celebrating the people, places, and culture of Washington, D.C. will debut in the District on May 22, as an exciting addition to National Bike Month celebrations. The recreational ride offers a unique car-free tour of the nation’s capital. 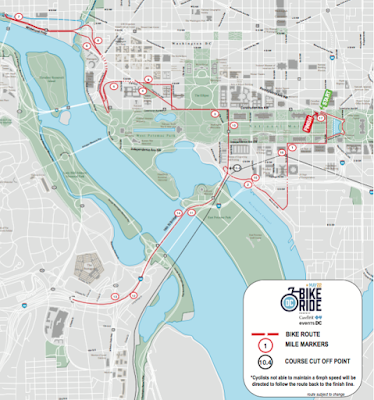 Riders will cruise past some of the most iconic sites taking in everything from the Washington Monument to the White House and the John F. Kennedy Center for Performing Arts. Participants will conclude their journey with a post-ride celebration near the United States Capitol. A complete ride itinerary is included at the end of this release. See detailed image of the route. More than 30 Mt. Vernon area cyclists and other interested citizens turned out for FABB’s February meeting, our first to be held in the Mt. Vernon District. A presentation by Adam Lind, Fairfax County’s Bicycle Program Manager, on the implementation of the county’s Bicycle Master Plan in the district flowed quickly into a valuable discussion on various bicycling related projects and issues that need county government and VDOT attention. Brett Kenney of Mt. Vernon District Supervisor Dan Storck's office spoke to the group about the Supervisor's support for bike lanes and focus on transportation issues. He mentioned that there would be an opportunity for the community to support bike projects on February 27th at the 29th Annual Mt. Vernon town meeting with Supervisor Storck, County Executive Edward Long, and Fairfax Co Board of Supervisors Chairman Sharon Bulova. Full house at Mt. Vernon FABB meeting. Huntington Avenue (between Rt. 1 and Telegraph Rd. ): Needs new infrastructure, such as a protected bike lane, a road diet, and sidewalks, to provide better bicycling and pedestrian access to the Metro station there. Sherwood Hall Lane: Needs improved connections between bike lanes on Sherwood Hall Lane across Ft. Hunt Road and along Morningside Lane to Mt. Vernon Trail along with a pedestrian crossing for a Metro Bus Stop near the intersection at Ft. Hunt/Sherwood Hall Lane/Morningside. Mount Vernon Trail: National Park Service, in response to local requests, is considering arranging for snow plowing during the winter. Mt. Vernon Highway: Needs numerous improvements, such as marked bicycling crossings and pedestrian crosswalks. Mt. Vernon Trail, photo courtesy of National Park Service. FABB intends to continue working with Fairfax County and VDOT on existing plans for the southern part of the county. George Washington Parkway: Adam Lind reported that it was possible that a project for improved bicycle/pedestrian crossings of the parkway to the Mt. Vernon Trail scheduled for 2018 might be brought forward a year. Potomac Heritage Trail: Trail extension to Route 1 is under way with a planned bridge scheduled to be built over Dogue Creek. EMBARK Project (Richmond Highway/Rt. 1): Plans are being developed to include bicycle and pedestrian facilities to complement the planned widening of Rt. 1 to a consistent six lanes, construction of a median Bus Rapid Transit (BRT) system, and, later, a two-stop underground extension of Metro’s Yellow Line to Beacon Hill and Hybla Valley. Mike Barth and other members of Mid-Atlantic Off-Road Enthusiasts (MORE) spoke to the meeting to seek additional citizen support for the group’s work with the Fairfax County Park Authority on a project in the Mt. Vernon District Park to provide better and safer natural surface trails there. Another part of the project addresses a major stormwater outfall problem that is a safety hazard and threatens Dyke Marsh. FABB appreciates the participation of all of the attendees, including local representatives of the Mt. Vernon Council of Citizens Associations, Fairfax County Trails and Sidewalks Committee, and the Fairfax County Tree Council. In addition to the projects above, the group raised worthwhile ideas about advocating for the enforcement of parking restrictions in bike lanes, multilingual outreach to area bike commuters, improved traffic light sensors, and making roads and trails safer with additional and well designed tree plantings. This meeting was part of FABB's effort to better serve and represent cyclists and other supporters throughout the county. During 2016 FABB plans to hold monthly meetings in all of the county’s districts and will be in the Mason District in March. If you would like to assist in setting up the program for the meeting in your district, please contact Steve Ward at srward1057@gmail.com. Senator Chap Peterson's "Dooring" bill, SB 117, was voted out of the House Transportation Subcommittee thanks to Del. Ken Plum of Reston, Del. Richard Anderson of Woodbridge, Del. Jim LeMunyon of Chantilly, and Del. Jeion Ward of Norfolk who overrode the move to table (kill) the bill and then voted to move the bill to the full House Transportation Committee where it will be heard on Thursday morning. If your Delegate is a member of the Transportation Committee, please send them a note asking for passage of SB 117. Also ask them to support SB 669/the Maintenance Reimbursement for Bike Lanes bill (see below). You could also thank the NoVa delegates for supporting the Dooring bill. SB 117 the “Dooring” bill was first on the docket in House Transportation SubCommittee 1 and was heard shortly after 7 a.m. Sen. Chap Petersen did a very good job of presenting it, and I spoke in favor of it, followed by Champe Burnley, & Lisa Guthrie of the Transit Assn. Del. Adams of Martinsville then moved to Table it, seconded by Del. Pillion of Abingdon. On the vote they were joined by Chairman Garrett of Lynchburg, but they were one vote short, as Dels. Plum of Reston, Ward of Newport News, Anderson of Manassas & LeMunyon of Chantilly voted Nay. That motion failing, Del. Plum moved to report, seconded by Ward. Being joined again by Anderson & LeMunyon , and opposed by the same 3, the bill was Reported 4-3. Chairman Villanueva (delrvillanueva@house.virginia.gov), and Delegates Scott Taylor (delstaylor@house.virginia.gov), & Glenn Davis (delgbavis@house.virginia.gov), asking them to support the bill. Certainly wouldn't hurt for our folks in Northern VA to contact Hugo, Minchew, Dudenhefer, LaRock, & Filler-Corn. SB669/the Maintenance Reimbursement for Bike Lanes bill also will be heard on Thursday morning, and those making contacts should certainly mention it in their messages, although we got some bad news this morning from one of the Delegates that a number of Delegates in the House are generally opposed to the conversion of vehicular travel lanes to bike lanes and do not support this bill which would incentivize a jurisdiction to do so. Despite his pessimistic outlook toward the bill, lets ask support for it anyway and see if we can prove him wrong. Now that VDOT is planning to build the I-66 Parallel Trail, access from that trail to the Vienna Metro station is critical. 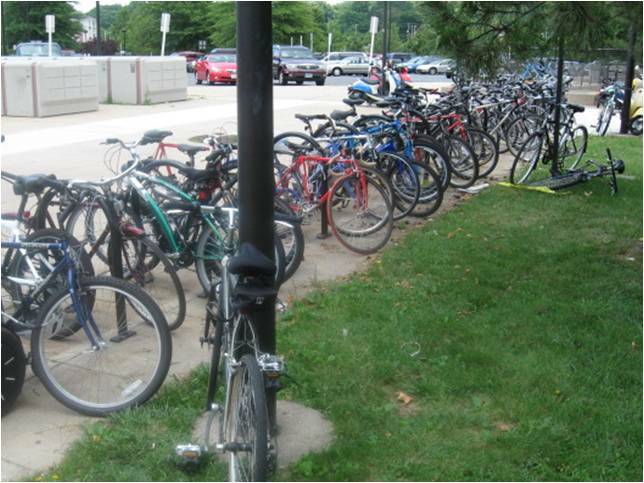 According to WMATA's 2013 bike parking census, the Vienna station is the third most popular station for bikes parked. 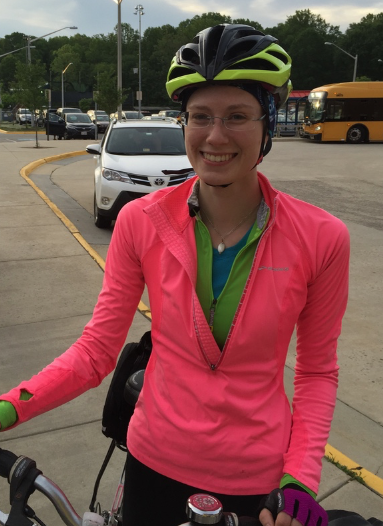 Olivia Demsko of Springfield took some time during Bike to Work Day 2015 to talk to FABB and responded to our brief survey. Like so many others we spoke to that day, she loves biking and would really like to see more bicycling infrastructure in the county. Olivia: For fun and exercise. Olivia: Everywhere and to school. Olivia: It's a great cardio workout without impact plus I like the feeling of togetherness when riding with others. Over a month after Snowzilla, there are still piles of snow and ice on the Fairfax Co Parkway Trail in Reston. 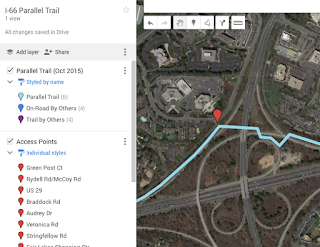 The section of trail between Sunrise Valley Dr and Sunset Hills Rd is heavily used by the communities on the north and south sides of the Dulles Toll Road. You might be able to see the bicyclist in the photo lifting her bike over one of the piles blocking the trail. We haven't checked out the parkway trail north and south of the W&OD Trail so we're hoping that most of the trial is clear. If you know the status please leave a comment. Waiting for the snow to melt is not a snow clearing strategy. For a month bike commuters and pedestrians have not been able to use this part of the parkway trail and many, many other trails and sidewalks in the county, including those adjacent to several schools. When people say that we can't afford to clear snow on these facilities, that you'll just have to wait for it to melt, what they are saying is that walking and biking aren't important. Imagine having the parkway or any road in the county being closed for a month. People wouldn't stand for it and we shouldn't either. Major transportation trails and ped/bike access routes to transit are critical and the county and VDOT need to develop a plan to deal with snow removal on those facilities. The Board of Supervisors' March 1 snow summit is the time to start. Please let Chairman Bulova know what you think about not being able to use major bike/ped facilities for a month. Photo courtesy of Fairfax County government. Always take an impact to the head seriously. Call 911 if you or another rider has a cracked helmet, a headache, lost consciousness, confusion, or vision changes. If it hurts to take a deep breath, get to the ER. Take your hands and palpate your abdominal area. If you have an area that is more tender than others, you could have internal damage. If your belly becomes distended or firm, that’s a sign that you could have internal bleeding and need medical assistance stat. Stop the bleeding with basic first aid—direct pressure (preferably with something clean) on the wound. Keep it there till help arrives. Be smart about neck and back injuries by checking your fingers and toes - any numbness and/or tingling is not good and may indicate a spinal injury. Discomfort in slowly turning your head 45 degrees to the left and right is a sign of spinal injury and a need to get to the ER. Make your personal info accessible with Road ID, dog tags, or place ICE ('in case of emergency') information in your cell phone. Leave a note or a text when riding alone. 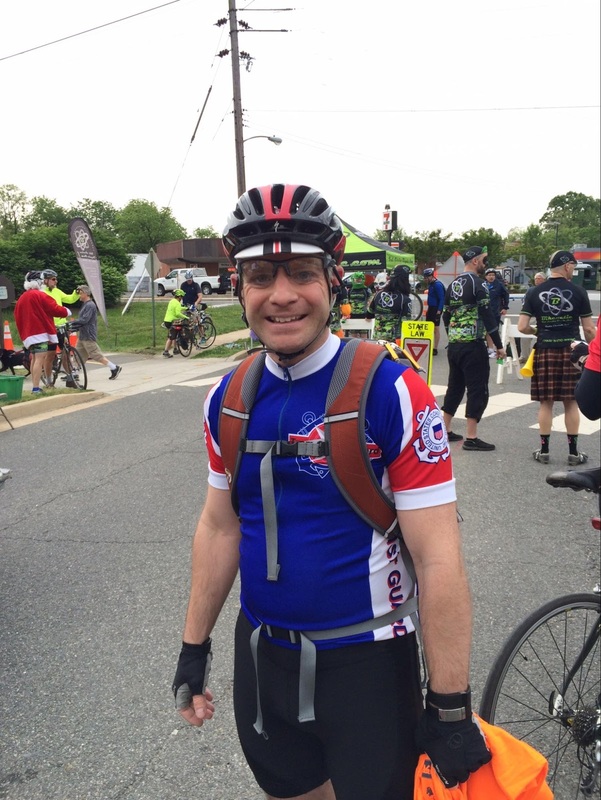 Safety is an important aspect of making bicycling better in Fairfax, and FABB encourages riders to always be aware of the need to be careful when out on the roads and trails. 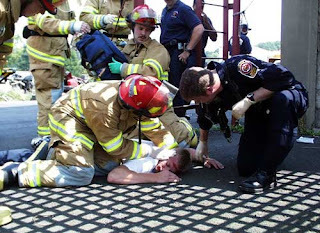 And, don't forget to show some love to Fairfax's great EMTs whenever you get the opportunity. One month after the blizzard let's see what the bike trails in Fair Lakes look like. Yep, just like I thought they would. Snow mountains as far as the eye can see down the trail. Maybe they'll be clear by March. VDOT motto: Cars first, pedestrians.....what are pedestrians? If you have ideas about how the county and VDOT can do a better job of clearing snow and ice after storms, please send a note to Chairman Bulova: "Fairfax County residents with feedback or questions they would like addressed at the “snow summit” can email Chairman@fairfaxcounty.gov." Reminder: FABB Meeting in Mt Vernon District on Wed.
As a reminder, FABB will be meeting in the Mt Vernon District tomorrow. Join us, at 7:30 pm at the Mt. Vernon Government Center Community Meeting Room, 2511 Parkers Lane, Mt. Vernon, VA, 22306. Biking near Ft. Belvoir in Mt. Vernon District. The meeting will feature a presentation by Adam Lind, Fairfax County’s Bicycle Program Manager, on the implementation of the county’s Bicycle Master Plan in the district. There also will be an open discussion period to allow Mt. Vernon residents to raise issues about improving local bicycle access and safety. The Mt. Vernon Government Center Community Meeting Room is accessible by Metro using Huntington Station (Yellow Line) and Bus #161 or #162. February’s meeting is part of FABB's effort to better serve and represent cyclists and other supporters throughout the county. During 2016 FABB plans to hold monthly meetings in all of the county’s districts. If you would like to assist in setting up the program for the meeting in your district, please contact Steve Ward at srward1057@gmail.com. 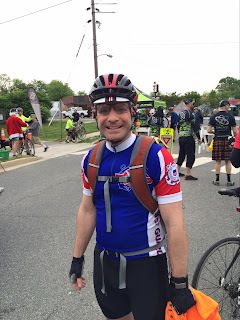 After picking up a Bike to Work Day 2015 t-shirt, Robert told FABB that he regularly rides from his home in Falls Church to his job in Ballston. For Robert, riding his bike is a convenient way to get to work and he loves the feeling of freedom he gets from being on his bike. Robert believes that better education about how drivers and bicycles can share the road would make it safer for him to ride. As FABB works to encourage bicycling as a viable alternative means of transportation, we also promote rider safety and legal rights through bicycle safety and education events. Adventure Cycling Association is a national bicycling organization with the mission to "inspire and empower people to travel by bicycle." Formerly known as Bikecentennial, the group has developed a network of national bike routes, including the original Bikecentennial Route 76 (TransAmerica Trail) extending from Yorktown, VA to Astoria, WA. The Atlantic Coast route from Maine to Florida passes through Fairfax County. The group celebrates their 40th anniversary this year with a number of events. 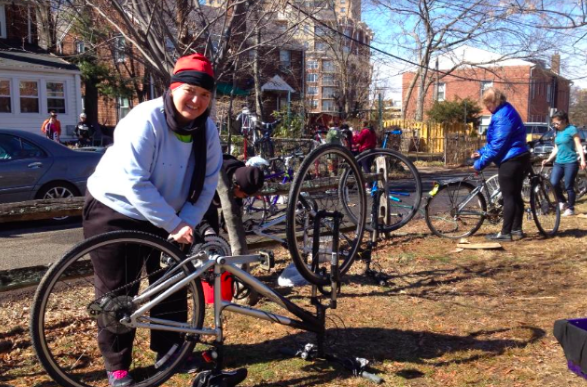 Join Adventure Cycling Association, the Reston Association, and the Reston Bike Club for a special gathering at Reston Association Conference Center on Sunday, March 6, with Adventure Cycling staff members Ginny Sullivan and Saara Snow. Enjoy snacks and refreshments courtesy of the Reston Association, Reston Bike Club, and the Friends of the W&OD Trail. Meet kindred cycling spirits, learn the latest about bike travel and cycling in North America — including exciting events planned for Adventure Cycling’s 40th anniversary: National Bike Travel Weekend, June 3–5, the Montana Bicycle Celebration, July 15–17, and Bike Your Park Day on September 24. Ginny and Saara will also highlight our tours program, membership, new routes, progress on the U.S. Bicycle Route System, and other national advocacy projects. Special presentations by local cycling organizations will round out the agenda. Two of your favorite local bike shops will be on hand to help you get on the road! Directions: Approach from DC: use 267 (Dulles Toll Road) to Reston Parkway Exit. Head south on Reston Parkway. Turn right at Sunrise Valley Drive. Turn left at first light, turn left into Reston Association parking lot. Metro/Biking Directions from DC: Use Metro/W&OD to Wiehle-Reston East station. Take W&OD west to Reston Parkway exit. Cross Reston Parkway at light, turn left onto multi-use trail that runs on west side of Reston Parkway. Stay on trail to Sunrise Valley Drive. Cross Sunrise Valley, then enter Reston Association parking lot near corner. Bike parking in front of the building. Please RSVP at info@adventurecycling.org or (406) 532-2751 by March 3. We look forward to seeing you in Reston! A bit about our hosts: Reston, VA, the only designated Bicycle Friendly Community in Fairfax County, is home to over 100 miles of paved and natural trails. Bisected by the W&OD Trail, the Gerry Connolly Cross Country Trail, the Fairfax County Parkway Trails, and providing a gateway to mountain biking trails at Lake Fairfax, Reston offers something for every kind of cyclist. Local biking organizations can help you plan a ride, a day trip, or even an adventure, and fill you in on what's going on in local advocacy to enhance the roads and trails in our area. Volunteer? Can you lend a hand? We are looking for a volunteer or two to help by prepping the gathering location and cleaning up. Please contact me at info@adventurecycling.org or (406) 532-2751, if you are interested. Beth Petersen Member Services Manager Adventure Cycling Association Inspiring and empowering people to travel by bicycle www.adventurecycling.org Phone: 800-755-2453. The snow and ice that was blocking trails and sidewalks last week is now mostly ice. With sub-freezing high temperatures predicted for the next several days, you can be assured that the ice will still be blocking the same trails and sidewalks for a while. We're hoping that the rain and warmer temperatures starting on Tuesday will melt some of the ice. But, we predict these same facilities will be blocked this time next week, a full MONTH of blocked access on the Fairfax County Parkway Trail and many sidewalks and trails leading to schools and transit stops. The Board of Supervisors will hold a snow summit at their March 1 board meeting. We're encouraged that according to Reston Now, "Bulova, as well as other supervisors, pointed out that the need for pedestrian access has increased greatly in the last 20 years as the county has gotten more urban. That is especially true in Reston, where a new Metro station — which requires various forms of rider access, including pedestrian, saw its first major storm since opening in summer 2014." The county needs to develop a plan, in conjunction with VDOT, to provide safe pedestrian and bike access to major destinations such as Metro stations, schools, and our major transportation trails such as the Fairfax County Parkway and others. FABB is willing to help develop the plan. VDOT had an incredible challenge with the latest snow; we understand that. However, it's inexcusable that bicycle and pedestrian access is blocked for a month at some key locations. We've heard the argument that VDOT doesn't have the equipment to clear snow on trails and sidewalks. VDOT works with contractors who do have the equipment that could be used. See the NBC4 video of VDOT contractors clearing a sidewalk after residents complained. the street every day before and after school. Our organizations have supported the Governor’s package of transit, HOV, and tolls for I-66 inside the Beltway as a far more effective approach than widening. This package of solutions will move 40,000 more people through the corridor in the peak hours faster and more reliably, and it won the support of Fairfax, Arlington, Falls Church, and the Northern Virginia Transportation Commission. Therefore, we are deeply disappointed by legislators of both parties who have pressed to undo this effective demand-management and people-moving package in favor of a widen-first approach. In doing so, the legislators have failed to understand the settled science of induced traffic where widened roads in metropolitan areas quickly fill up again. They also failed to understand the benefits of funding transit through the toll revenues, and the effectiveness of the package in moving more people through the corridor during peak hours. We're grateful to the Governor for fighting for the package of solutions he has championed for I-66 inside the Beltway. Although we are very disappointed that the widening is being accelerated before more effective solutions are given the opportunity to work, the agreement reflects a political compromise. That said, we urge the Governor and local governments to accelerate the funding and implementation of transit and supportive ride-matching and transit marketing necessary to ensure we maximize the number of people using transit and carpooling before the widening takes effect in 2019. We urge legislators to understand that an economically successful region like ours cannot build our way out of congestion through highway expansion. That widening is just a band-aid with an increasing cost to people’s homes, neighborhoods, schools, parks, and health. We have long made the case that investment in transit and smart growth, which can be coupled with road and parking pricing, is the most effective approach to addressing traffic congestion in the near, medium, and long term. Creating a network of walkable, transit-oriented centers and communities allows us to maximize walking, biking, and transit trips, while minimizing driving. It reduces the sprawling development which is the chief contributor to our traffic congestion, and creates the types of communities so in demand today. Finally, it is important to recognize that Arlington County’s internationally recognized success in coupling transit-oriented development (TOD) with transit investment has done more to reduce regional traffic congestion than any other jurisdiction or any highway expansion in Northern Virginia, while increasing the region’s economic competitiveness. Arlington’s success is a compelling case for why we should continue to maximize our investment in transit and TOD across Northern Virginia rather than widen highways all the way to DC. The Coalition for Smarter Growth is the leading organization in the Washington DC region dedicated to making the case for smart growth. Its mission is to promote walkable, inclusive, and transit-oriented communities, and the land use and transportation policies needed to make those communities flourish. Learn more at smartergrowth.net. The Southern Environmental Law Center is a regional nonprofit using the power of the law to protect the health and environment of the Southeast (Virginia, Tennessee, North and South Carolina, Georgia, and Alabama). Founded in 1986, SELC's team of over 60 legal experts represent more than 100 partner groups on issues of climate change and energy, air and water quality, forests, the coast and wetlands, transportation, and land use. Learn more at SouthernEnvironment.org. The Virginia Chapter of the Sierra Club is 15,000 members strong. We are your friends and neighbors working to build healthy, livable communities, and to conserve and restore our natural environment. Learn more at sierraclub.org/virginia. South Lakes HS and Terraset ES. Even with the mild temperatures of last week the compacted snow and ice piled on area trails and sidewalks is still blocking access in many areas. Today I noticed at least two people walking in the road where snow made walking on the sidewalk or trail impassable. It may be another week or more before it's safe to walk in these areas, and more snow is predicted tomorrow. According to Chairman Bulova's Facebook page: "Our Board will hold a 'Snowzilla Summit' at our March 1st Board Meeting, and we will invite officials from VDOT and our own County staff. The purpose of the Summit is first to thank them for the good job they did responding to the blizzard of 2016, but also to examine how we want to address some issues that were problematic (such as the need for clearing pedestrian facilities, school bus stops and commuter bus shelters)." We look forward to the snow summit and are glad that Chairman Bulova identified the need for clearing pedestrian facilities. It will take more than a snow summit to fix the problem. The Board needs to find the resources to ensure people are not forced to walk in the street to access Metro, schools, and other important destinations. We need to identify critical transportation trails that should be cleared. Property owners in these areas need to help. 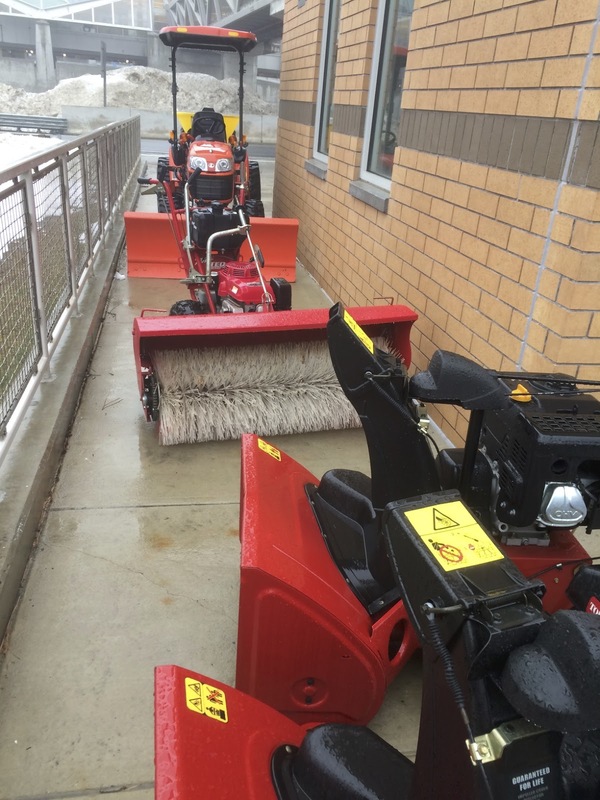 The county can follow the lead of NOVA Parks and Reston Association which have both devoted resources to clearing snow on the W&OD and RA trails. The county needs to work with VDOT to ensure that already cleared trails and sidewalks are not used as snow dumping grounds. According to the WTOP article about the summit, "Fairfax County residents with feedback or questions they would like addressed at the “snow summit” can email Chairman@fairfaxcounty.gov." If you're concerned about blocked ped and bike access after the latest snow storm, contact Chairman Bulova. 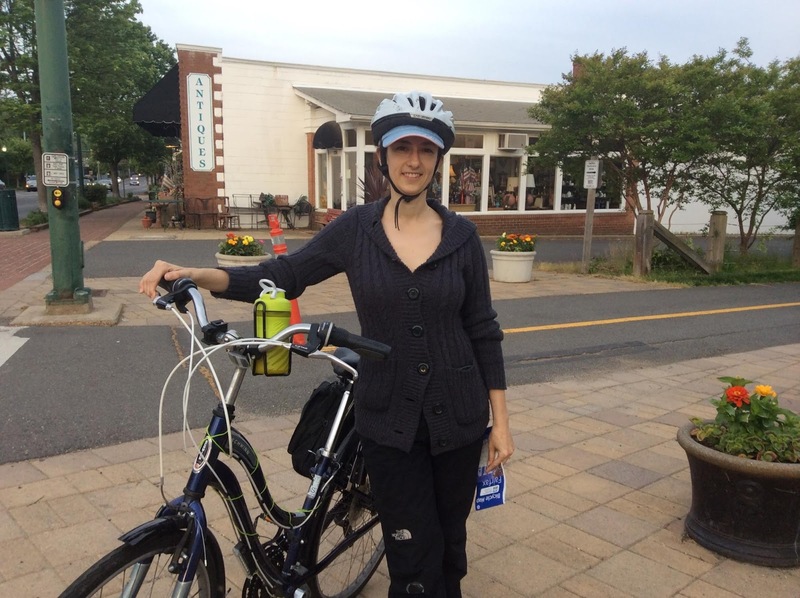 Vienna-resident M.J. Erskine paused at the Bike to Work Day 2015 pit stop in her town and told FABB that she rode her bike as a primary means of transportation. M.J. said that she doesn’t like driving and is happy to be able to ride her bike around Vienna, Tysons, and Falls Church. In response to FABB’s question about what she would like to see changed to make it easier and safer to ride in Fairfax County, M.J. said that more connected bike lanes would help. In the Sunday Post Dr Gridlock devotes an entire column on the importance of trails as part of our transportation network: We need to accept urban trails as part of the commuter network. While the focus of the article is the clearing of bike commuter trails on National Park Service land, it applies to all of our regional major paved trails. We are very grateful that NovaParks and Reston Association have devoted resources to clearing snow from the W&OD Trail and over 50 miles of RA trails. They have set an example for Fairfax Co to do the same for our major transportation trails. Update: See GGW's David Alpert's opinion piece also in the Sunday Post: Walkers were left out in the cold after the 'Snozilla' blizzard. Many of us have been struggling with large amounts of snow on trails, sidewalks and at intersections after the most recent snow storm. While it was an historic storm, these same trails and sidewalks are blocked after almost every storm in the area. The compacted piles of snow take weeks to melt. In my area, bicycle and pedestrian access to the Wiehle Metro station is still blocked by snow and ice around the station, most of it dumped there by VDOT snow clearing crews. Times have changed, and trails in urban areas are commuter routes for many. In recognition of that, the park service in the capital region is considering a change in its policy that would incorporate the trails into the post-storm cleanup plans. That’s a welcome idea to Gregory Billing, the executive director of the Washington Area Bicyclist Association. You may see fewer people out on bikes in the winter, but cold weather doesn’t stop people from commuting via bicycle. Ice and snow on the trail does stop them. If a cyclist can’t use a bike lane on a city street, the commuter can shift to a regular lane. Commuters who use trails, such as the popular Mount Vernon Trail along the Virginia side of the Potomac River, are in a tougher spot. “Often, there are no safe alternatives for miles,” Billing said. We have written to our local House representative and others urging them to coordinate with VDOT to prioritize snow clearing efforts to provide safe access to Metro stations, schools, and along major commuting trails. Chairman Bulova plans to hold a snow summit and cyclists and pedestrians need to make sure the county gets the message that we deserve safe passage on major access routes. Come join us on Wednesday, February 17th, at 7:30 pm for our monthly meeting, which is being held for the first time in Mt. Vernon District at the Mt. Vernon Government Center Community Meeting Room, 2511 Parkers Lane, Mt. Vernon, VA, 22306. The meeting will feature a presentation by Adam Lind, Fairfax County’s Bicycle Program Manager, on the implementation of the county’s Bicycle Master Plan in the district. In addition, other speakers will provide reports on bicycling-related developments and events. There also will be an open discussion period to allow Mt. Vernon residents to raise issues about improving local bicycle access and safety. Evie Ifantides works for Fairfax County Public Schools at an office on Waples Mill Rd just north of Route 50. She lives in Fairfax City. Evie started biking to work in 2012 and since then has logged 500 round trips (well, 499.5 the last I heard and given the weather, it may be another day or so before she gets in another ride). Evie has written a positive, inspirational story about her decision to get to work by bike. She did some riding over the years but it wasn't until a colleague suggested she bike to work that she started riding in earnest. In March of 2011 I began participation in a cohort leadership program with my employer, Fairfax County Public Schools. In October of 2011, our teacher laid out some prizes/trinkets for answering questions. I must have answered a question correctly and I went up to the table and picked the bike lock as my prize. Not sure why - I did not really need one since I was not biking. As part of our final project in our cohort, we had to present on a topic that if implemented would create a positive impact in our work environment. In March of 2012 my cohort friend, Richard Michelback, presented his vision about FCPS personnel biking to work. He was inspiring! I had that Specialized bike in the shed but it needed a lot of help. I mentioned Richard’s vision to my dear friend and neighbor, Carolyn, and she said that she had a bike I could use and basically have. A grey Gary Fisher - in a matter of minutes - that bike arrived at my home. That same week, I was sitting at the Fairfax City Parks and Recreation Advisory Board meeting next to cycle enthusiast, Frank Linton. He was there along with a George Mason student discussing the possibility of a bike route from the Vienna Metro to George Mason University. (I am happy to report that there is a pretty safe bike route that GMU students can now take) The meeting lasted till 10 p.m. and as we were leaving I asked Frank if he was able to map out a couple of possible routes for me to bike to work. He immediately said YES and on Saturday, March 17, at 10:30 a.m. he came to my home and we took one route to my work location, at Fairfax Ridge and another route back to my house. The four mile route takes about thirty minutes. I also had to find a bike rack at work. Who knew that there was one at the Fairfax Ridge. One of my colleagues and building supervisor, Dianna DiPasquale, helped me find one – in the parking garage. It was behind barbed wire and we got it out and placed in the garage by the steps. 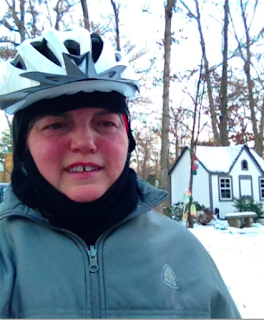 My first ride was going to be that Wednesday, March 21, 2012 … It was cold and very foggy and I decided not to ride. I emailed Richard and Frank and both said that it was smart not to have biked that day. Richard also added that he would be willing to come to my house and bike with me the first time on Thursday. He also asked me if I had any lights - hmmmm I did not. I went to our local bike shop, Oasis Bikes, which unfortunately is no longer there, got the lights and they gave me a 10% discount because I mentioned Frank’s name. So I got the lights and the next morning at 6:45 am – Richard drove to my house from his home in McLean. He put all the lights on and we started riding. It was still dark and still a little foggy but I felt really good being with Richard at my side. I showed him the way. 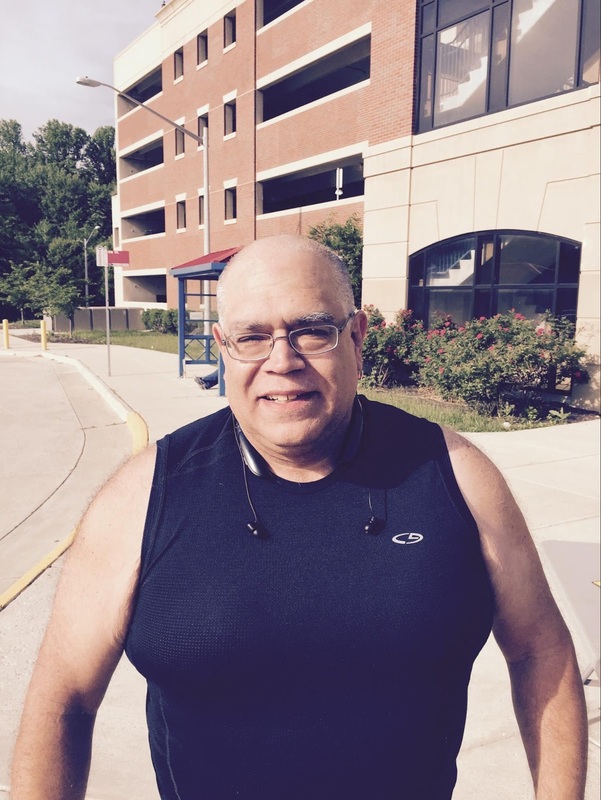 His project to get FCPS staff to ride to work was becoming a reality one person at a time. Your help is needed to continue offering a strong voice and guidance in support of the I-66 bicycle plan. Please let VDOT know you support the bike plan and provide your feedback on trail placement, access points and other concerns you may have. Comments can be submitted until February 4th (Deadline was extended to Feb. 9). Please direct them to Ms. Susan Shaw, PE, by email to Transform66@VDOT.Virginia.gov, via the online comment form on the project's website, or join the discussion. Reference "I-66 Tier 2 Revised EA" in the subject line. The revised Tier II Environmental Assessment was recently released for public review and comment with updated language integrating the bicycle and pedestrian improvements approved as part of the I-66 Prefferred Alternative. According to the revised EA, the I-66 project will include a major regional trail along the I-66 corridor outside the beltway (click on image to see map) as well as new bicycle and pedestrian facilities on all rebuilt bridges. 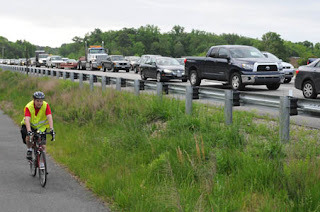 The report states that including these improvements will increase access to public transportation, travel choices, connectivity and safety throughout the I-66 corridor. Specific design requirements for the bicycle infrastructure was also recently released as part of the I-66 Request for Proposals, which included the draft Technical Requirements. The regional trail will be a combination of a parallel trail constructed within the I-66 right-of-way as part of the project, and improvements to adjacent roads and trails that will be built separately in coordination with local jurisdictions. Bike and pedestrian improvements at I-66 crossings are included where bridges are being reconstructed. All new facilities crossing I-66 or associated ramps shall be grade-separated unless otherwise approved by VDOT. Where proposed noise barriers are to be located near homes, the parallel trail will be on the I-66 side of the noise barrier. There are 13 access points proposed for the parallel trail, along with the suggestion that access generally be at half-mile increments. Park-and-ride facilities will include bike and pedestrian connections to nearby facilities, and covered bike racks for a minimum of 75 bicycles. Mile marker and wayfinding signs shall be incorporated in the design. Existing trails impacted by the project shall be replaced. For more information on efforts to include bike facilities in the I-66 project, visit FABB's I-66 page. Robert Sohl, an avid bike commuter from Burke, answered FABB’s brief survey questions while participating in Bike to Work Day 2015. Robert: Primarily, for my health. Robert: To my work in Vienna and on the Washington and Old Dominion Trail for fun. Robert: I get a real sense of accomplishment from riding. Robert: Just more awareness for safely sharing roads by bikers & drivers.